ETNA was formed late in 2003 by its founder and Chief Instructor Malcolm Phipps 8th Dan and the worldwide Chief Instructor to Seishinkai Shotokan Karate International. 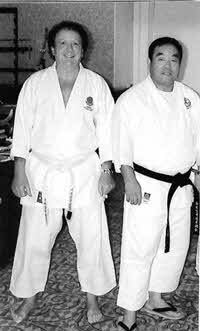 Sensei Phipps has trained in the kobudo art of Nunchaku now for over forty years and in 2003 trained with Sensei Fumio Demura (see photo below right) in Dallas, Texas at the USA Martial Arts Hall of Fame Seminars and Awards. After discussions, Sensei Demura thought it would be an excellent idea for Sensei Phipps to set up a traditional Nunchaku Association in the UK and so the idea was born. Sensei Demura and Sensei Phipps both agreed that in the main this art is not taught correctly enough and should be taught traditionally and relatively along the same lines as a good karate class. So, with this in mind, the Association trains only in traditional Nunchaku using correct terminology and genuine Okinawan kobudo techniques. There is a proper structure to the Association with gradings being held every six months. There is a syllabus that is followed rigidly that includes kihon, kata and kumite, and a booklet that all students receive on joining. There is everything a student would need to know about the weapon in this professionally produced booklet, which indeed includes the syllabus. The starting age for training is eight years of age but from eight to sixteen years of age the student must use foam or rubber Nunchaku only. After sixteen years of age then a student has the option of foam rubber or wood. Nunchaku must be traditional from twelve to fourteen inches in length, preferably cord. No metal, telescopic or weapons with flashing lights and bells are allowed. To join ETNA, it is necessary that a student already has a decent knowledge of the martial arts. Many people will feel that eight years of age is too young but this is not the case as long as the youngsters follow the rules of the Association and the martial arts code in general and indeed would only be allowed to use foam or rubber weapons and must never use the weapon or carry the weapon in the street, other than to and from the dojo and, of course, in the dojo. The weapon also, as most students know, is a great help in co–ordination for all the other martial arts, especially Karate, helping a student to be proficient with both hands and arms. As explained earlier, the Association is a traditionally run group and is run on the lines of a good karate lesson. Please note: all ETNA events will now appear on the main Association Calendar. Combination nunchaku techniques with Sensei Malcolm Phipps.